BOOKING FOR 2019 NOW!! Free Beach Service Included!! ...WALK RIGHT OUT AND ENJOY IT!! MAKE YOUR FAMILY VACATION MEMORIES ON OUR BEAUTIFUL BEACH! Designer Owned 'Ground Floor' condo has Granite Everything! Coral Reef Club is located DIRECTLY on the beautiful white sand beaches of Destin. It has 3 private beach accesses and 300 feet of private beaches for our guests to enjoy! This intimate Gulf front 3 story property is located beside Henderson Park Inn at the end of Scenic Highway 98. Tastefully decorated in 'Exotic West Indies Style', this Designer Owned condo will not disappoint! Just step outside this 1st floor unit right onto the beach. The condo has one bedroom with Island Influenced Furnishings, Serta Perfect King Size pillow top mattress and luxury-designer bedding and linens, hallway bunk beds that the kids will love, and a Broyhill queen size sofa sleeper. * 2 updated bathrooms have GRANITE SINKS with adjoining bath/shower area with High Quality towels! Enjoy breathtaking gulf views from our patio or grab an umbrella & chair and enjoy the sand and emerald green waters that await you. You can even spend some time ENJOYING OUR HEATED POOL! and our family favorite -Johnny O'Quigleys Sports Bar & Grill! Big Kahuna water park is nearby for an extra special kids adventure, Mini Golf, Go-Carting or Bowling! Rent bicycles and ride up and down the Scenic Drive! Rent Bikes and cruise along the Scenic waterfront drive!! You'll never run out of things to do!! There are also many great golf courses for your enjoyment. Coral Reef has completely renovated this charming, 3 story property. Welcome to The Coral Reef Club! Hurry and Book NOW for 2018 !! We are HONEST & PERSONAL......5 STAR RATED! .....Just Read what our Guests have to say!! We discovered Destin Florida and the beautiful Emerald Coast, and we knew right away this quiet, beachfront property was exactly perfect for us. LOCATION LOCATION LOCATION!! THE BEACH, of course!! I have tried to make our condo as comfortable as possible, with a little touch of home. Our property has an amazing beach, that is private!! !Open up the glass doors and you are directly on the beach & Henderson State Park is right next to us. Perfect ground floor access to our patio and the outdoors. Also, it's close the EVERYTHING! Bike Rental Delivered to your door. Pretty hard to get ground floor access this close the beach anywhere in Destin. The condo was fabulous! Very well equipped kitchen, fun decor and an awesome beach! The sunsets were amazing! My family stayed in this lovely condo for 4 nights for Christmas trip, and enjoyed every minutes of it; Unbeatable location, unbeatable Scenery of beach and unbeatable price; The condo has everything we need, especially for family with kids like us. We definitely will come and stay here for another vacation. Amazing condo, well furnished, right on the beach! Delightful condo, well equipped. Beautiful location, view can't be beat. The bed gave us a perfect night's sleep, impressive. Even more than we expected. 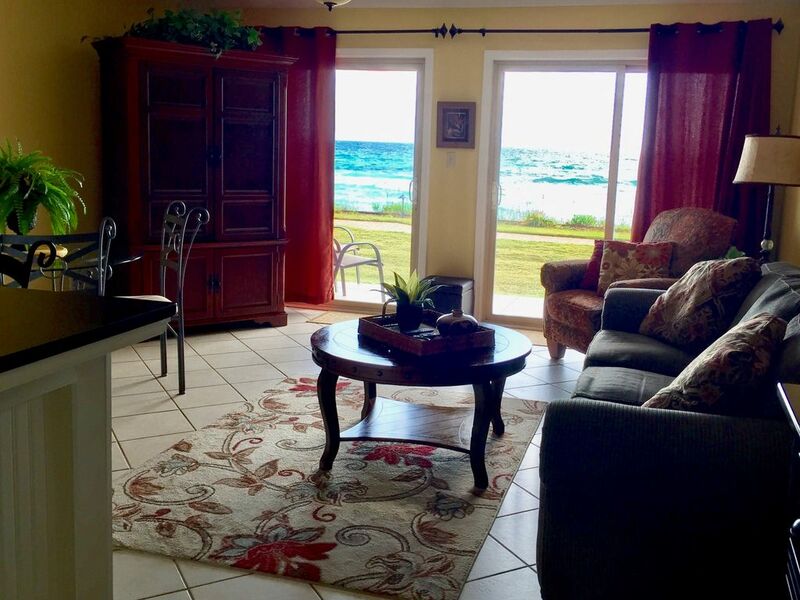 Steps from the beach, clean, and spacious condo in the center of it all in Destin. Our family of 4 had an amazing stay. We would love to stay again soon. ABSOLUTELY NO REFUNDS: You may opt to purchase Travel Insurance through CSA. OPTIONAL Beach service is Available for $15 day~ 2 chairs & Umbrella (on a weekly basis) through CORAL REEF CLUB onsite.